When Birdland opened for business in December 1949, it quickly became the epicenter of the New York City jazz scene. The club was named after Charlie Parker, the bebop sax wizard whose friends called him "Yardbird" (several stories of how the nickname originated have become urban legend), which was shortened to "Bird," those four letters coming to represent hot alto improvisation. In 1952, when a radio show began broadasting live from "The Jazz Corner of the World" (as Birdland was also referred to), club manager Morris Levy asked George Shearing, a blind, British-born pianist who often performed at the nightspot, to compose and record an instrumental theme for the show; lyrics were added by B.Y. Forster, a one-time-only pseudonym for songwriter George David Weiss. The song was a takeoff of sorts on "Lullaby of Broadway" (written around 1935 by Harry Warren and Al Dubin, who also composed "September in the Rain," a hit single for Shearing in 1949), repopularized the previous year in a movie of the same title starring Doris Day. "Lullaby of Birdland" represented a world of smoke-filled clubs and jazz hipsters in close proximity to, but worlds away from, the spectacle of the musical stage and the more structured big band dominance of the previous two decades. The jazz community embraced the melodic song. Piano great Erroll Garner recorded a well-received instrumental version for Columbia Records in 1953; significant early vocal renditions include a 1954 single release by Ella Fitzgerald on Decca and Sarah Vaughan's recording for Mercury Records later the same year. 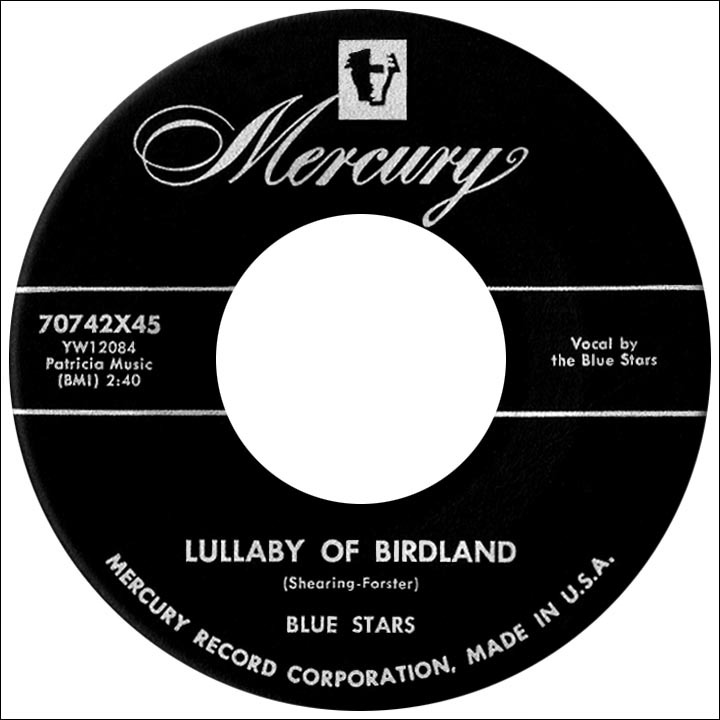 While these and other recordings of "Lullaby of Birdland" are close to the hearts of many jazz fans, the biggest hit version, by far, was a French language translation by The Blue Stars. Prior to the group's formation, East Durham, New York native Blossom Dearie was in the process of establishing herself in the music biz (born Magrete Blossom Dearie, with a name like that she had to pursue a career in entertainment!). She'd studied piano since childhood and possessed a unique, high-pitched singing voice. After performing with the bands of Woody Herman and Alvino Rey in the mid- to late-'40s, she contributed 27 seconds of vocal retort to King Pleasure's 1952 R&B hit "Moody Mood For Love," an interpretation of saxophonist James Moody's instrumental version of "I'm in the Mood For Love" (written by Jimmy McHugh and Dorothy Fields) done vocalese style with a great deal of additional lyrics. The recording is now considered a classic; Blossom Dearie was there for its creation. She made some instrumental piano recordings but preferred singing. After moving to Paris in the mid-'50s, Dearie became an original member the Blue Stars. The four-man, four-woman act (whose number varied in later years) recorded "Lullaby of Birdland" in 1955. Group singer Bob Dorough contributed a nifty, two-note piano solo (with flourishes) on the track and Dearie's vocal contribution is discernible within the skillful eight-member vocal performance. The recording was given a big band treatment by arranger Michel Legrand (later known in the U.S. for "The Windmills of Your Mind" from The Thomas Crown Affair and the original film score of Summer of '42, both Academy Award winners). 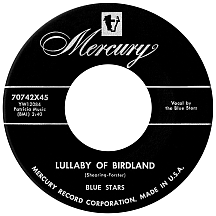 Released on Mercury, "Lullaby of Birdland" spent five months on the charts in America and hit the top 20 in February 1956. For several years the group, later called The Blue Stars of France, included Michel's sister Christiane Legrand (a soprano, she was more or less a replacement for Dearie when she returned to the States). In the 1960s, Christiane often worked with her brother, dubbing the singing voices for actors in some of the more successful films he composed music for, including The Umbrellas of Cherbourg and The Young Girls of Rochefort. In addition, she was one of the founding members of The Swingle Singers, a French group led by Alabama-born bandleader Ward Swingle. A mostly a cappella ensemble known for vocal adaptations of classical compositions, they won five Grammy Awards during the '60s including Best New Artist in 1963. As for Blossom Dearie, she made several well-received jazz and pop vocal albums for Verve and Capitol in the '50s and '60s and was a frequent guest on The Today Show with Dave Garroway and The Tonight Show with Johnny Carson. All in all, she made records and performed in concert for the better part of six decades.